During the Summer of 1647 Oliver Cromwell, Henry Ireton and other senior officers (Grandees) in the victorious parliamentary army, attempted to negotiate a settlement with the defeated King Charles I. 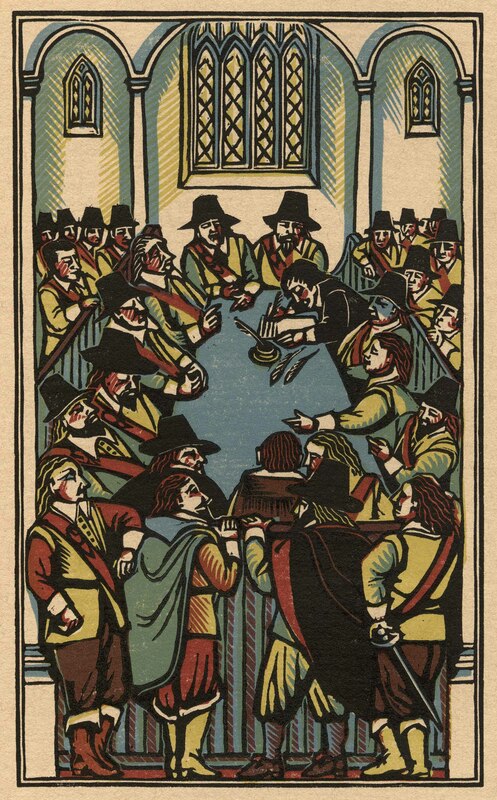 Their proposals included a strong monarchy and House of Lords, but this lost them the support of the more radical elements among the military and civilian populations who had formed an informal alliance known as the Levellers. freedom of conscience, freedom from impressment into the armed forces, everyone equal under the law and no penalties should be made for not going to church, or attending other acts of worship. The Leveller's ideas had come to dominate the thinking of soldiers and officers in Cromwell's New Model Army. In October 1647, five of the most radical cavalry regiments in elected Agitators (Latin to drive) who were known as New Agents to represent their freethinking political and religious views. The New Agents issued a political manifesto: The Case of the Armie Truly Stated, and endorsed the constitutional proposals drafted by civilian Levellers in the Agreement of the People. The Grandees responded by inviting the New Agents to debate their proposals before the General Council of the Army. But what happens at the end of October is a remarkable series of exchanges in the most passionate language, and it is extraordinary in this intimidating place that men of all walks of life could confront each other and talk so bluntly and so fearlessly to one another using passionate language. They’re inviting one another to consider the fundamental questions of human dignity and human governance. In a sense it is to Cromwell, Ireton and the senior officers’ credit that they recognised that this army had a right to state what it was feeling. They were probably rather appalled about the direction the debate took, and in the end suppressed the demands, but initially there was very real sympathy from the senior officers for the grievances of their men.